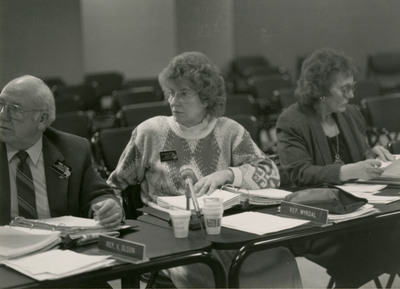 Photograph of Vince Olson, Rosemarie Myrdal, and Dagne Olsen (left to right) listening to an unseen speaker. A Republican from Edinburg, Rosemarie Myrdal represented District 11 (Pembina and Walsh counties) in the North Dakota House from 1985 until 1993 and served as the Lieutenant Governor of North Dakota from 1993 until 2001. Dagne Olsen represented District 19 (Grand Forks County) in the North Dakota House. A Republican from Manvel, she was elected to the House of Representative in 1980 and served until her death in 1994. Republican State Representative Vince Olson was elected to the House in 1985 and represented District 24 (Barnes County) for three terms.